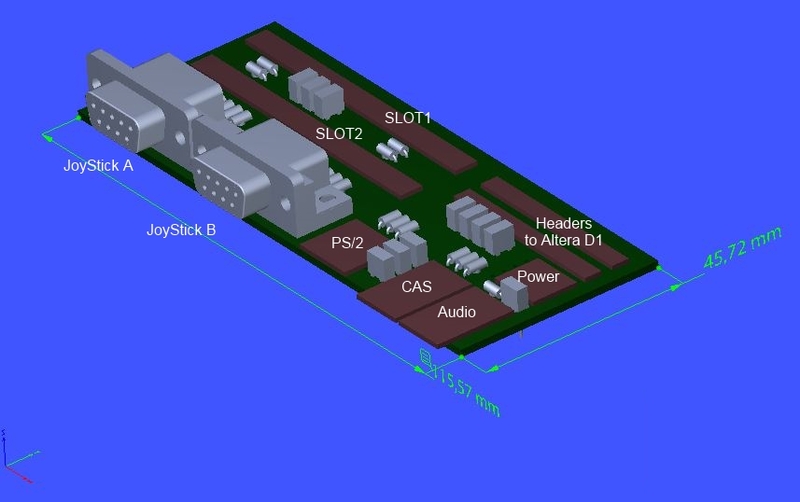 Last week I was thinking about a schematic that I’ve seen on Caro’s website for connecting Joystickports, a keyboard port, Audio out, CAS and slot connectors on an Altera DE1. I’ve worked this out in a proof of concept just to see how it looks. The idea is to place the connectors like this. Also I’ve got the idea to put Slot1 in a angled possition, so it’s possible to use big cartrides or a slotexpander, without blocking slot 2. Current status is, that it’s just a Concept but please share your ideas in the comments.